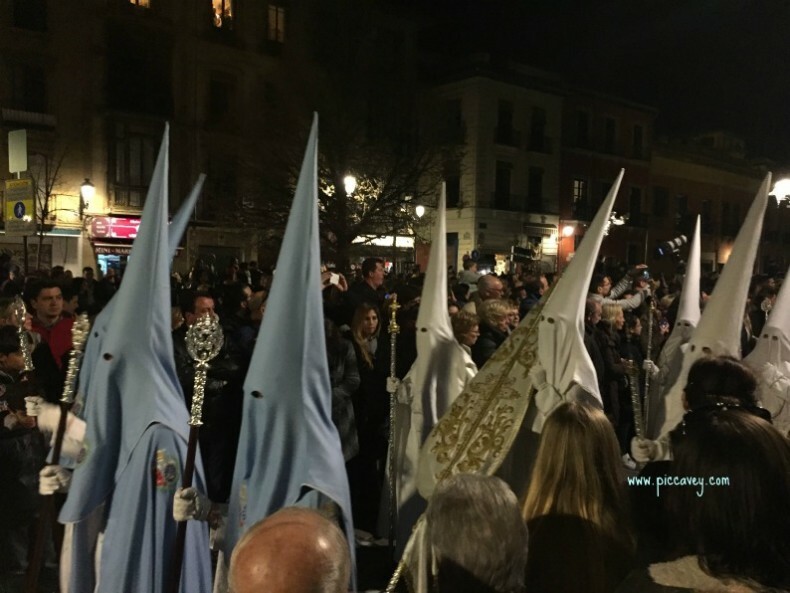 The Semana Santa of Granada was declared an International interest in 2009. Easter has a special significance in Andalusia and there are many traditions surrounding Holy week. The traditional Semana Santa processions attract huge crowds particularly in Seville, Malaga and Granada. During Easter it´s impossible to ignore the fervor with which the different groups prepare for this week every year. Many train and prepare for the processions for months. Straight after Christmas has g, the ´cofradias´ start to prepare the groups and decide who will be in which place. 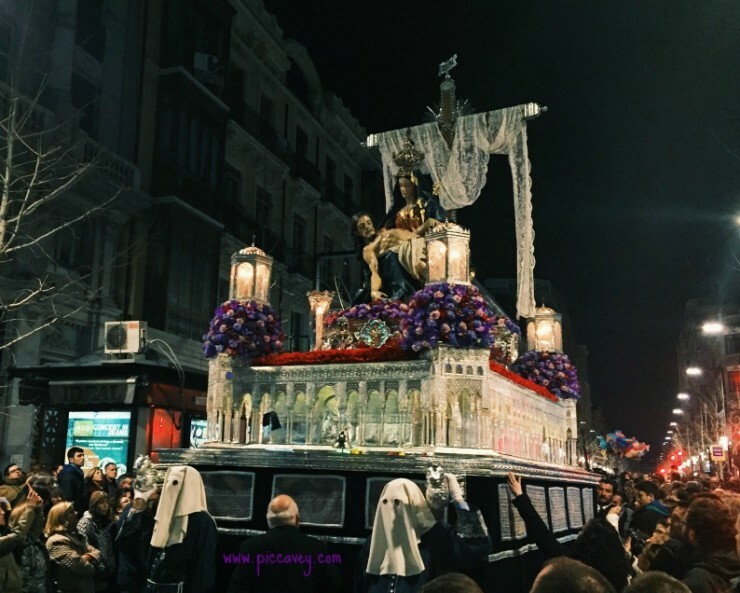 You may have already seen an Easter traditions in Spain and not known about the way that its is organised who what role each participant plays in the procession. 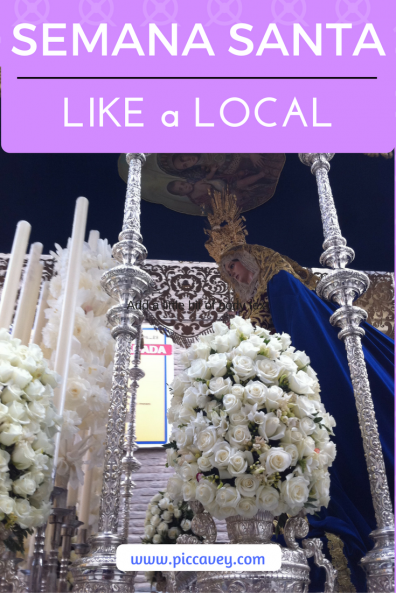 This guide may help in time for this years Semana Santa. There are 33 cofradias each year taking part in the Granada processions. The costaleros in each cofradia carry the float with the virgen Mary or Christ figure. Each person is measured and arranged by their height. So that the wooden beams beneath the wooden structure rests on their shoulders well. This process is known as the ´igualá´ where they make sure the float is straight and everyone underneath is ´comfortable´ to bear the weight. Most of the processions comprise of two images or figures, one of Christ and the other is the Virgin Mary. Although some (like the Alhambra procession) only have one image. Each ´paso´ or float is decorated with fresh flowers, silver and golden metalwork, wooden sculptures and religious imagery. Depending on the size and preparation of the float the weight varies. There are different people involved in the procession. 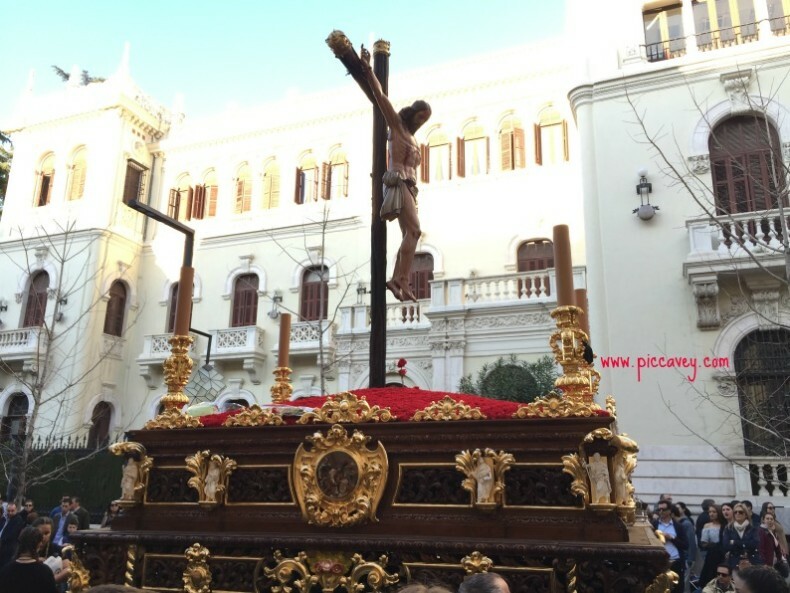 Costaleros are underneath the large wooden float with the figure on. 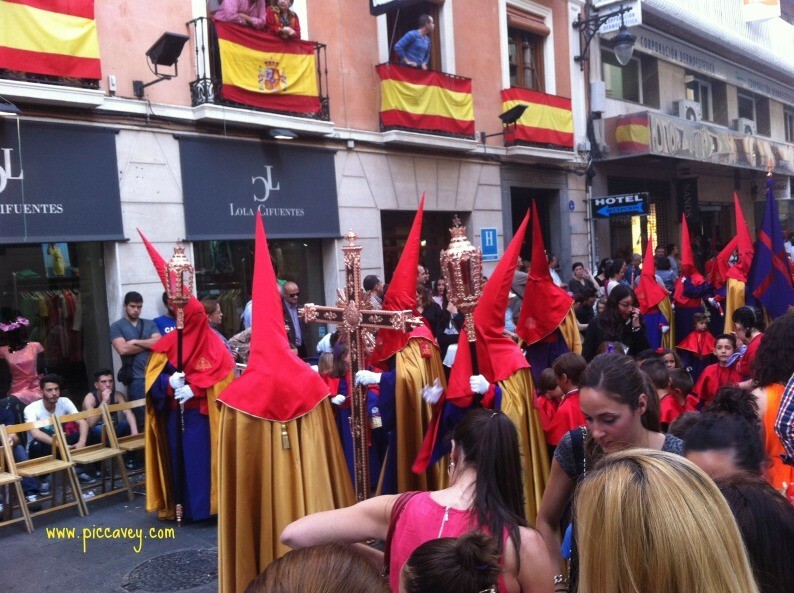 The people who carry the Virgen or Christ figure and wear a sacking headpiece to protect their shoulders. Then you have the camareras, the Virgen is accompanied by women dressed in black with the lace shawl and typical comb, mantilla and peineta.They often carry large candles too. At the end of Semana Santa the lace shawl is white (or cream) coloured in the processions after Resurrection. As they are no longer in mourning. Then you have the Penitentes or Nazarenos. These figures are totally covered and seen easily with there pointed hood, known as the caipirote. Just small holes for their eyes are left in the material. Sometimes you may notice their feet if they are walking barefoot. Their robes are different colours depending on which brotherhood and church they belong to. Then there is a marching band or sometimes two if the procession is a long one. They play solemn music, marking the time and rhythm that the procession should move along to. At the very beginning of each procession is the Cruz de Guia. A large cross made from wooden (often Taracea, marquetery) or silver which announces that the procession is Christian. The Capataz is the head of the procession who coordinates the group. This is especially important when turning corners or going into or underneath archways or doors. This figure is usually just ahead of the first ´paso´ and dressed in a suit. Lookout for the ´paso´ the day before the procession inside the church. You may get to see it close up before the processions. All of the processions must pass through the Carrera Oficial at their alloted time. In Granada this is along Calle Angel Ganivet, The Cathedral and Plaza Pasiegas. This means that at the height of Easter week it is practically impossible to move around these areas in the afternoons. Thursday and Friday are especially busy days. There are gates which the local policia control to let the crowds move up and down these streets between one procession and another. This means that you can get stuck on one street for a while until they allow you to walk on. Bear this in mind when moving around the city at Eastertime. You will need to do errands in the morning. Also some businesses are closed in the afternoons around the city cent during Easter week. There are some delicious cakes and pastries which are typical at Easter. Leche frita is a square shaped dessert, cut into pieces, and tastes similar to the filling of a custard tart. 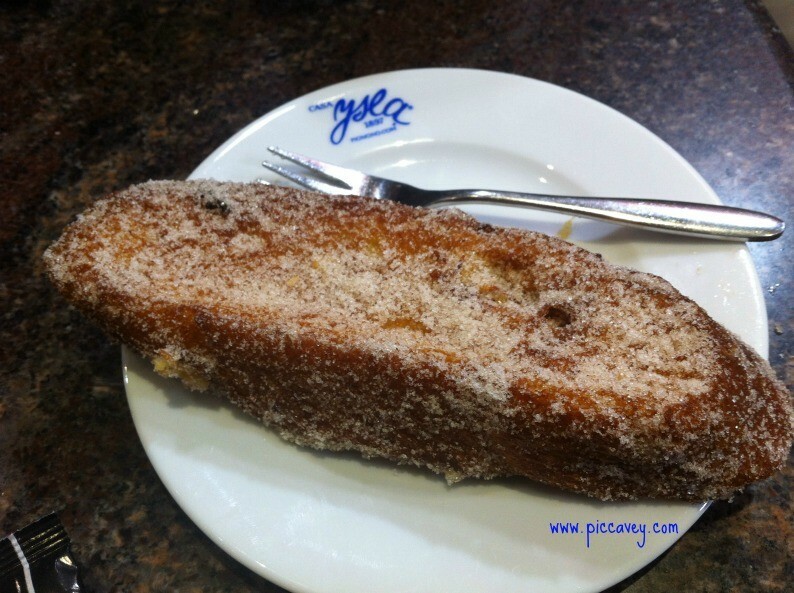 Buñuelos are like doughnuts or sweet fritters are also abundant at this time of year. Pestiños are available all year in the Alpujarra area but are very typical at Eastertime. These biscuit like tubes have a sweet covering, often with a dash of aniseed liqueur in the batter. 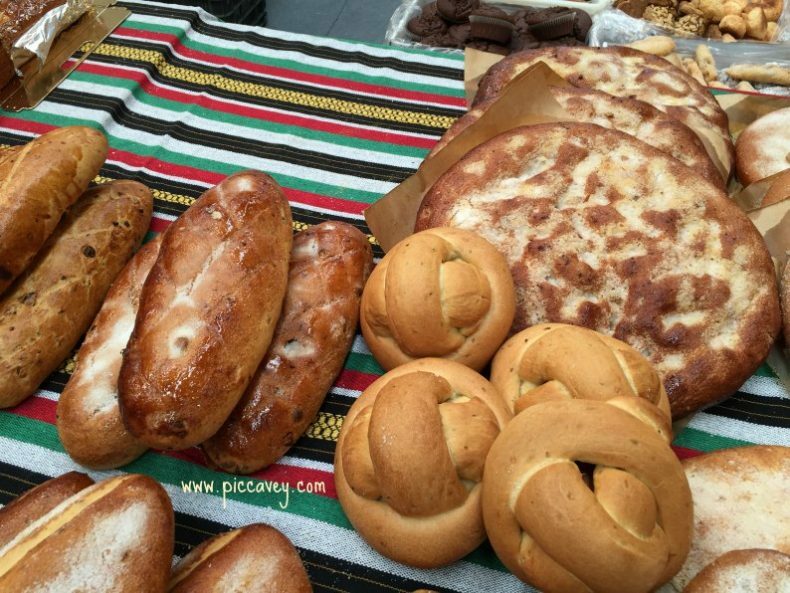 A great place for foodies at Easter is the fair Hecho en la Alpujarra which is held annually in Orgiva. 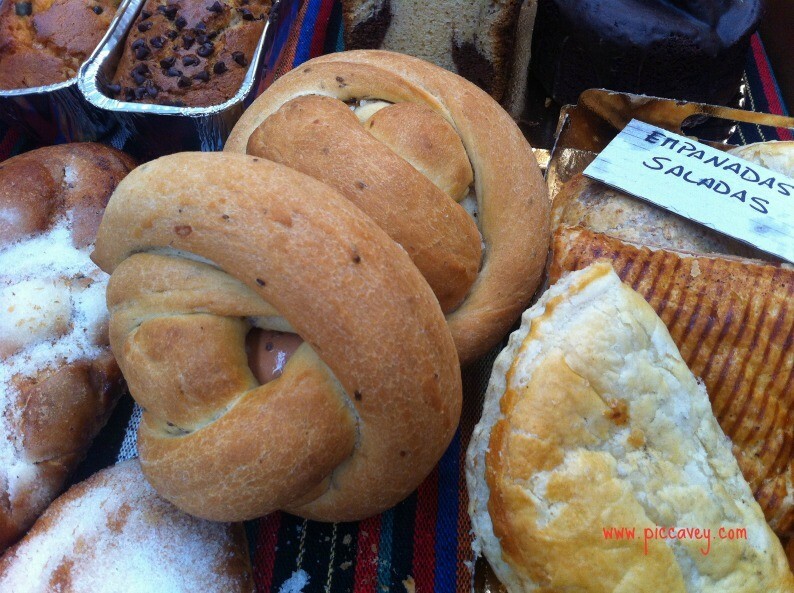 Here lots of locally made cakes are for sale from the Alpujarra bakeries. Food during Easter week is generally based around Fish, mainly cod, Spinach and chard and chick peas. No meat is consumed in traditional Catholic homes. This food is known as Menu de Vigilia and you may see this offered in restaurants around the city. So between procession and procession you get hungry. A quick drink and a tapa between each cofradia is a great idea. The two must see places at Easter in Granada are Bar Leon and El Tabernaculo. Bar Leon on Calle Pan (close to Plaza Nueva) has a sit down restaurant with mid week menu and a busy bar for tapas and raciones. Popular with the cofradias the ceilings and walls are covered with Easter posters from all over Spain. This has been in business since 1959 and is still popular with the locals. El Tabernaculo on Calle Navas. This tapas bar is small and usually packed. Again covered in Semana Santa parafernalia, a must see for its character. 5 processions leave on Palm Sunday in Granada. The most traditional is La Borriquilla (little donkey) this leaves from the church of Perpetuo Socorro and goes along Calle Elvira. 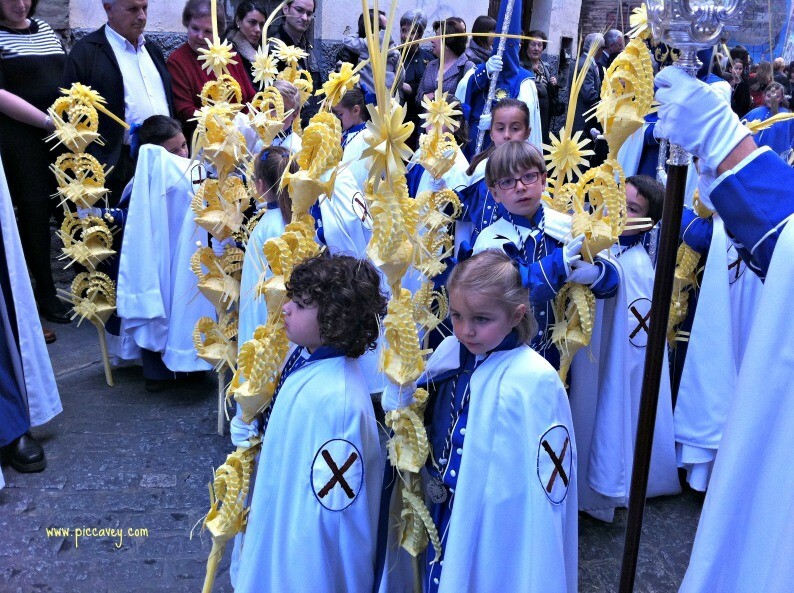 There are lots of children participating in this procession, they hold palm branches which have been treated and sculpted to form decorative shapes. This begins around 4pm and ends at 10.30pm in Calle San Jeronimo. The best place to see it is close to the Puerta de Elvira as it leaves Gran Via and goes underneath the Archway. Despojado from leaves de Mondujar along Calle Alhamar at 7pm. Encarnacion from the Sagrario Church in San Jeronimo at 5.45pm. 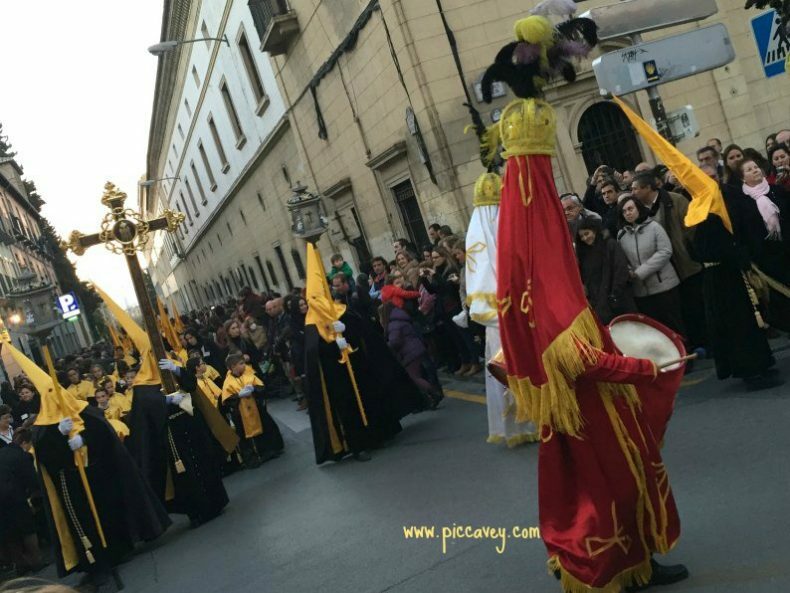 5 processions leave on Easter Monday in Granada. Luz from Iglesia Corpus Christi in Zaidin. Look out for this at 6pm on the Puente Romano over the River with the Realejo/Albaicin in the background. Dolores leaves from the Church of San Pedro and San Pablo on Carrera del Darro at 6pm. This is a picturesque procession as it wind along beside the river into Plaza Nueva. Huerto from the Comendadoras de Santiago in Realejo. Leaves from Calle Santiago and heads along Calle Molinos. San Agustin departs from Santo Angel Church in San Anton at 8.45pm. 4 processions leave on Easter Tuesday each Semana Santa in Granada. Plaza Nueva se viste de gala cuando se abren las puertas de San Gil y Santa Ana: salen el Gran Poder y la Esperanza. el Vía Crucis y La Cañilla. La Lanzada from Los Dolores on Carretera de Armilla. Moves through the Zaidin and into the city. Look out for this at 6.30pm on the Puente Romano over the River with the Realejo/Albaicin in the background. Via Crucis leaves from San Juan de los Reyes in the lower Albaicin at 5pm. Look out for this procession on Carrera del Darro below the Alhambra palace. Via Crucis leaves from San Juan de los Reyes. Another procession leaves at 6.45pm and moves along to Plaza Nueva ending around 1.00am along Calle Elvira. 5 processions leave on Holy Wednesday a in Granada. 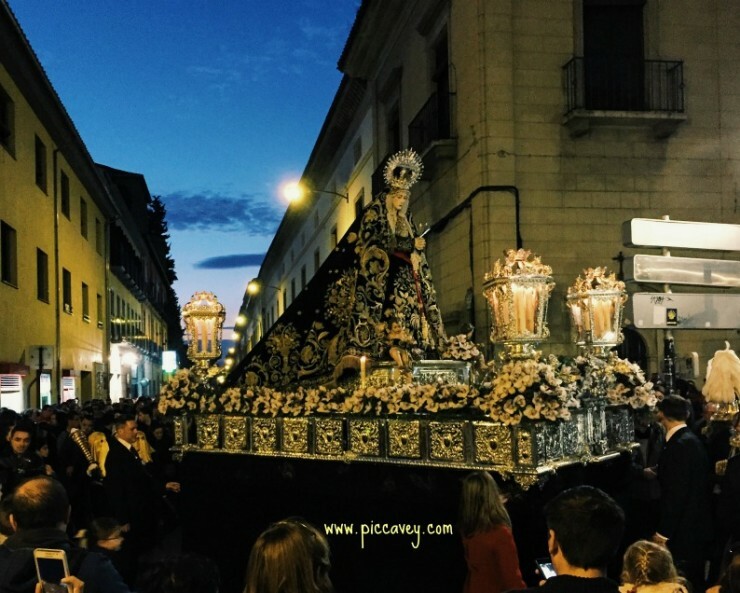 However the main Semana Santa event is el Cristo de los gitanos, this procession leaves Gran Via at 4.45pm and ends around 3.30am in the Sacromonte. There are several places where it´s good to see this procession although you need to get your spot early. Leaving the church on Gran Via at 4.45pm. As the procession leaves the church and moves along the Gran Via, the ´paso´ comes out of the church door. The ´costaleros´ below have to come out by theor knees to lower it, so that it doesnt hit the archway as it leaves the door. 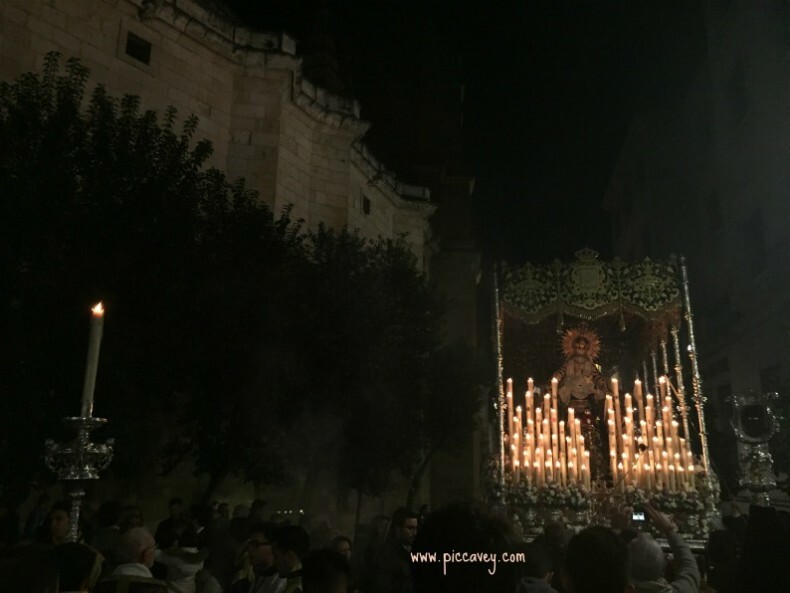 At 10.20 pm the procession goes up to the Albaicin on the Cuesta de Chapiz. This part of the route is done running as the hill is so steep it makes it ´easier´ if it´s done quickly. After 11pm along the Camino de Sacromonte there are Saetas (traditional singing) bonfires and lots of revenrences to the procession. Estudiantes leaves the Church San Justo y Pastor on Calle Escuelas and goes along to the Plaza de Trinidad. Penas leaves the San Matias Church on Calle San Matías at 7.20pm and ends around Midnight. Rosario leaves from Santo Domingo Church in the Realejo at 7.20pm. Nazareno leaves from Carmelitas Descalzas church on Calle Pavaneras in the Realejo at 8pm. Of the five processions held on Thursday the most important ones are in the Albaicin. The narrow white washed streets create a special atmosphere for these processions. Also look out for the Silencio which is done in silence and with the streetlights turned off along its route. Concepcion also known as La Concha locally, leaves the Calle Zafra at 4.15pm and ends around midnight. Salesianos leaves at 5pm from the Zaidin barrio and ends around 2am. At 11.30pm as the procession crosses the Puente Romano bridge over the river is a great spot to see it. Aurora leaves from San Miguel Bajo in the Albaicin at 5.50pm and ends around 2am. The typical Albaicin streets make a great backdrop for this procession. Estrella leaves from San Cristobal Church in the Albaicin at 6pm and ends at 3am. This procession returning up the Cuesta de Alhabaca is amazing to se before it arrives at St Cristobal church. Silencio leaves at midnight from the Church of San Pedro and San Pablo on Carrera del Darro, this ends in the Cathedral at 3am. Below the Alhambra along the Carrera del Darro is a great spot for an Epic photo of this silent procession. There are 6 processions on Good Friday or Viernes Santo. One of the most popular with children is La Soledad. At the head of the procession are some figures called ´Chia´ children shout out to them ´Toca Chia´ so they play their trumpet. Another procession I enjoy on Good Friday is the Entierro as it has representation from different brotherhoods. So you see Nazarenos with different colours in the same parade. Before the Procession of El Cristo de los favores at 3pm at Campo del Principe there is a service to ask for wishes to be granted. This traditional act attracts large crowds on the square. Soledad leaves Santo Domingo in the Realejo at 1.45pm and later leaves the Monasterio de San Jeronimo on Calle Rector Lopez Argueta at 7pm. Ferroviarios leaves the Church of San Juan de Letran on Av Constitucion at 4.30pm and ends just past midnight. Favores leaves from San Cecilio Church in Campo del Principe at 6pm. Entierro leaves at 8.30pm from the Church of Santa Ana in Plaza Nueva and arrives back at 20 past midnight. On Saturday only the Santa Maria de la Alhambra leaves the church and it has one float inspired in the Lions Courtyard of the Alhambra palace. The best place to see this is on the Cuesta Gomerez as it passes through the archway coming down from the Alhambra into Plaza Nueva. In the Alhambra complex you can only be inside when the procession leaves if you have a ticket to visit the monument for that afternoon. it leaves at 5.30pm and returns just after midnight. Facundillos leaves from Santo Domingo Church at 10.30am and ends at 2.40pm. 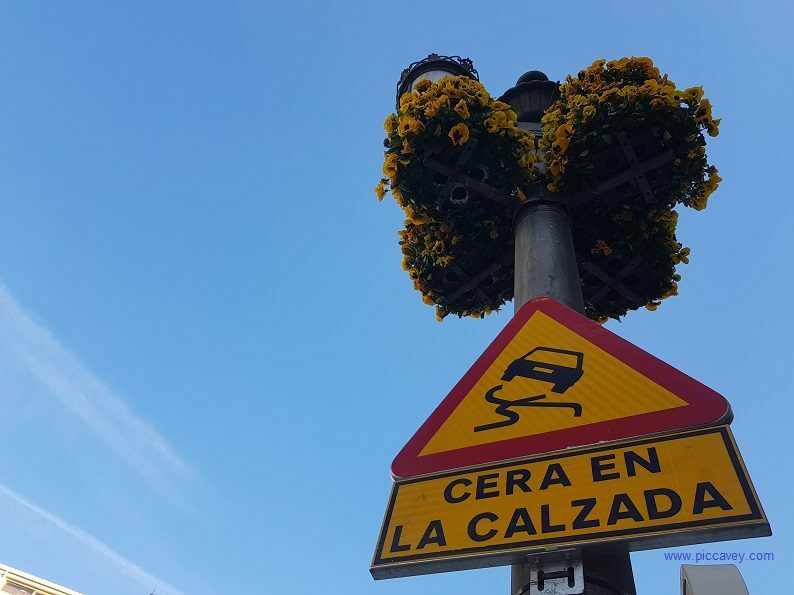 Resurrecion leaves at 10am from the Zaidin barrio on Calle Primavera and ends around 5pm. At 4pm look out for this returning along stone bridge Puente Romano just below El Corte Inglés on the River. Resucitado leaves from Sagrario Church at 11am and ends at 3pm. Look out for this in Plaza Nueva at 12 noon. Make sure you leave the car behind and well parked. Semana Santa is a busy time. Wear comfortable shoes for walking and non slip soles as floors are coated in slippy wax. Layers are best. The evenings are cooler and afternoons warm and sunny. Plan your route ahead of time to beat the crowds. Fantastic post Molly! I didn’t really understand Semana Santa until now. Looks like I need to plan a trip to Granada around this holiday. Thank you for your thorough account! Glad you enjoyed reading Rob! During the Easter Week this is a busy period for Restuarants and Bars in Granada. This is actually super interesting. I’ve experienced Semana Santa myself in Mexico but never thought about what actually happens. Thanks for explaining, I learned something! I’d love to experience it myself in Spain, now that I know what it actually is! Woo so pretty the Semana Santa in Granada, I have never been in Granada but i hope one day yes.